Every major intelligence agency across the world does the exercise. Call it the "hit by the bus" scenario. If leader X of important/sensitive/unstable country Y drops dead tomorrow, what happens? Who takes over? How might that change things? For some countries, the exercise is simple. For others, it's murky and complicated. Then there's North Korea. Governments in Washington, Seoul, Beijing and Tokyo are now running this drill, because anonymous intelligence sources are saying Kim Jong Il, the 66-year-old dictator in Pyongyang, is ill. He might even have had a stroke, the reports say, and in any case he did not show up for the mass 'celebration' the country threw for its 60th anniversary, a pretty unusual absence, even for a North Korean leader not known for his predictability. Keep in mind that the government analysts and independent academics who try to piece together scenarios about North Korea's internal politics for a living are like astronomers looking at the moon through the wrong end of a telescope. Not because they're not smart enough to look through the proper end, but because North Korea is so sealed off from the rest of the world, the wrong end is all they've got. The North Korean government  in the person of 80-year-old Kim Yong Nam, ostensibly Kim's second in command  said on Sept. 10 there was "no problem" with the Dear Leader. Still, a senior South Korean intelligence analyst told TIME that "something strange has clearly happened. We know Kim Jong Il has been out of sight for a few weeks, and we know physicians from outside North Korea have come to Pyongyang. But that's all we know at this point, and we believe our intelligence on this matter is [better] than the CIA's." If Kim is indeed incapacitated, dying or already dead, what might that that mean for Korean Peninsula, for 60 years now one of the most heavily militarized neighborhoods on the planet? Analysts and government sources insist his demise is unlikely to mean the collapse of the North Korean regime, at least in the short run  something which the North's two closest neighbors most emphatically do not want to see. As the analysts at the Control Risks Group say, "the regime's brutal authoritarianism may be repugnant, but its unraveling would raise questions the North's neighbors would much rather postpone." Neither China nor South Korea want to see a chaotic transition, in part because that might mean tens of thousands of refugees pouring across their borders, or, in the worst case, some sort of civil war in the WMD-laden North that might require U.S. intervention. That, indeed, is Beijing's absolute worst-case scenario. But like dictators everywhere, Kim has made certain that the country's senior military officers are on his side. They have profited from the country's extensive illicit businesses (narcotics, weapons, pirated cigarettes and pharmaceuticals) and hold powerful government posts. No one knows who will emerge as the new leader. Speculation often centers on one of his three sons, the favorite being the Swiss-educated, alleged Eric Clapton fan, Kim Jong Chul (though in a memoir published last year, Kim's former sushi chef, a Japanese citizen with the pseudonym Kenji Fujimoto, says Jong Chul, who is in his late 20s, is out because his father once said, "he is no good because he is like a little girl.") It may not matter because the North's generals can run the country regardless of its figurehead. This is good news because Kim and his generals agree on the key policy that concerns the outside world: the North's nuclear weapons. Whether you believe that Pyongyang is making a good-faith effort to close out its nukes  as the U.S. State Department does  or is manipulating America and its allies for economic aid, Pyongyang is unlikely to change course. The bad news is, North Korea is again struggling with food shortages and possible famine, a problem that could worsen if Kim is debilitated. "When it comes to allocation of resources, Kim is the one who decides," says Cheong Seong-Chang, director of Inter-Korean Relations Studies at the Sejong Institute. "Now, different players may try to grab a bigger piece of the limited resources." The ironic result: Without Kim, "the food situation for the North Korean people will get worse, heightening the crisis from within." The safe bet for an analyst trying to predict outcomes using limited information is to assume the status quo will prevail. But sometimes history can veer off the beaten path in cruel ways. The possibility that Kim Jong Il's death could make things worse for the benighted North Koreans is unpleasant to contemplate. Then again, North Korea under the Kim family dynasty has been a singularly cruel place. 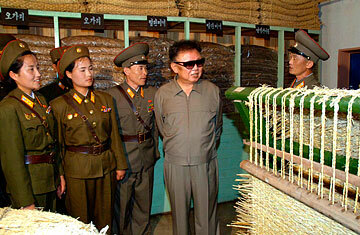 See photos of Kim Jong Il here.